Bike Maintenance – It’s a love and hate relationship. Once I’m there with my hands covered in grease and parts removed and scattered (In a semi-organised fashion) across the garage, I really quite enjoy my bike maintenance. But up until that point there’s the slight trepidation of ‘have I got all the right tools’, ‘what parts will I need’, ‘will I be able to get it all apart’ and possibly the most obvious one of ‘will it all go back together again’! And so after putting it off and to be fair on myself; not really being able to find the time either. I set about doing the necessary on Sunday afternoon. I used a bike maintenance stand because I had access to one. Shortly after my workplace joined the cycle to work scheme they also bought a maintenance stand (good idea), so I borrowed that. It’s a basic one from Planet X, under the ‘Jobsworth’ tools brand and it does the job well. It’s really good for holding the bike up at a good working height. 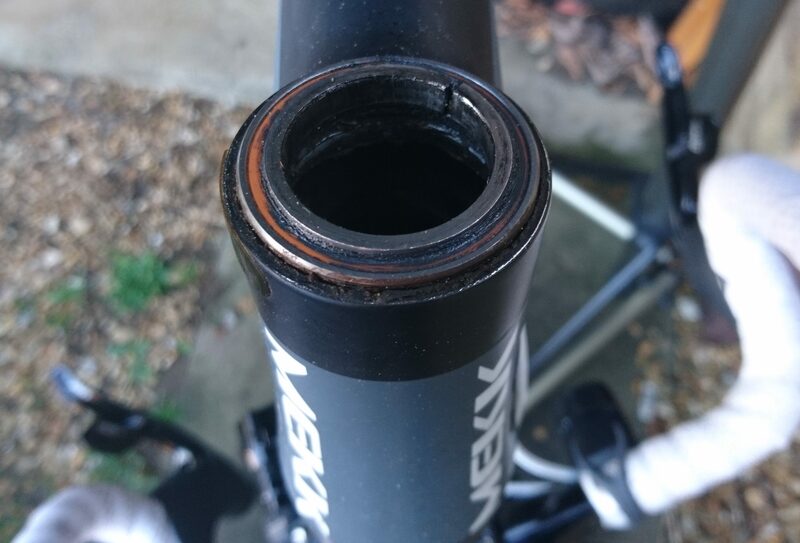 I wouldn’t want to try and loosen any really tough nuts while my bike was in the stand though; like your bottom bracket cups for example. It’s just not stable enough for that sort of task. So with the bike mounted, I took my front wheel off, loosened my stem bolts and then fully removed the top cap bolt and top cap. 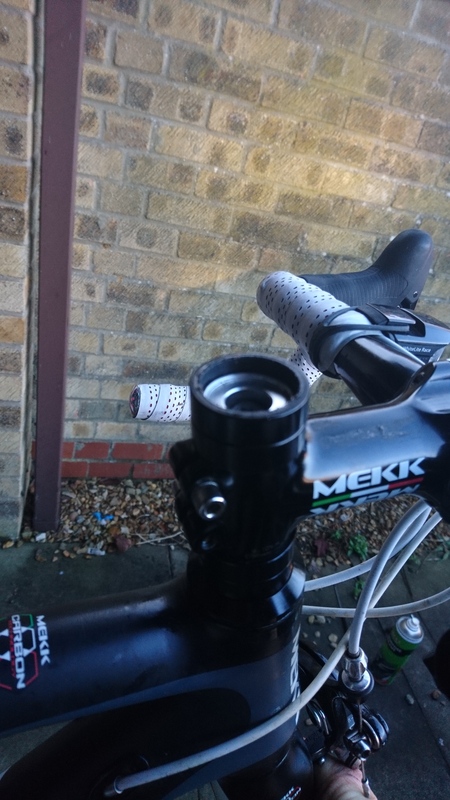 This then allows you to lift off the stem, assuming the bolts were sufficiently loosened. I was able to do this without removing or releasing any of the cables from my brakes or bars and just let my bars dangle from the cables. Alternatively taping the bars to the frame is the more professional option. Theoretically with nothing holding it in at the top your fork should have already fallen through the headtube and now be dangling from the front brake cable; of course it won’t because in reality it will be stuck in place held up by the gooey, gritty grease and muck that has worked it’s way in there over the months of riding. So I took a block of wood and a hammer and using the wood for protection gave the top of the steerer a bash. The pro option of course is a rubber mallet and a second pair of hands to hold the fork so that it doesn’t fall out suddenly and hit the floor or tug too hard on the cables! For me, with the right amount of gentle force the fork came free in a nicely controlled manner. I’ve done this kind of stuff before after all; just not on a MEKK road bike until now. The lower bearing is made up of a ‘bearing race’ fitted to the crown of the fork – this is the ‘crown race’ and a set of ball bearings held in a ‘captured’ frame which is pressfit into the bottom of the headtube. There is also a rubber seal that fits around the crown race to act as a weather seal. For me it was the lower bearing that has been causing my recent steering issues. A generally jerky feeling to the steering as the ball bearings wouldn’t roll freely. So I set about cleaning out the dirt from these bearings with some spray lubricant and a rag. You can clearly see the muck come running out onto the rag as you spray the lube into the bearings. Then I gave the bearings a good run over with a dry rag to clear out the spray lube before applying some thicker grease by hand. The pro mechanic would of course have a grease gun for this! The upper bearing is different. MEKK have fitted a sealed unit here at the top. This pops out really easily, along with a split spacer and can be replaced as a complete sealed bearing. You could pop the seal off this bearing and flush it out too but I’d rather replace it if I found that it needed attention. Mine doesn’t; it runs nice and smoothly. It does beg the question though as to why you would fit a sealed unit at the top where you don’t get that much dirt ingress and a loose ball unit at the bottom where the dirt causes more issues. 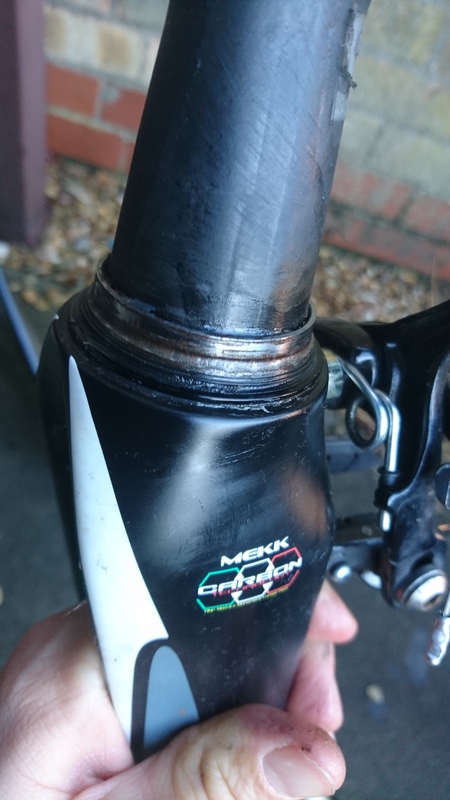 Whatever the reason, my lower bearings were quite well caked with dirt but nothing that a wipe around with a rag and a good flush with some spray lube couldn’t correct! I use Fenwicks Multi-Purpose Lubricant which I find works really well for lubricating levers and also flushing out dirt, grime and grit. Just remember that this isn’t the final lubricant for your headset bearings; you’re only using this as a cleaner. So take a rag after flushing and mop up any excess. Then apply a more suitable thick grease that will fill the gaps around the bearings and stay put. I use grease like this for these sort of tasks; it’s not a cycling specific product and comes in a big tub that lasts for ages. Then of course reassembly was just the reverse of how I took it apart. The only difference being the setting of the tightness of the top cap bolt. What you need to do is place the stem and spacers onto the steerer tube but not tighten the stem bolts. Then fit the top cap and as you tighten the top cap bolt keep checking the headset for play (loose movement). The best way to do this is to hold the front brake firmly on and push forwards and backwards on the handlebars as if trying to move the bike despite the brake. 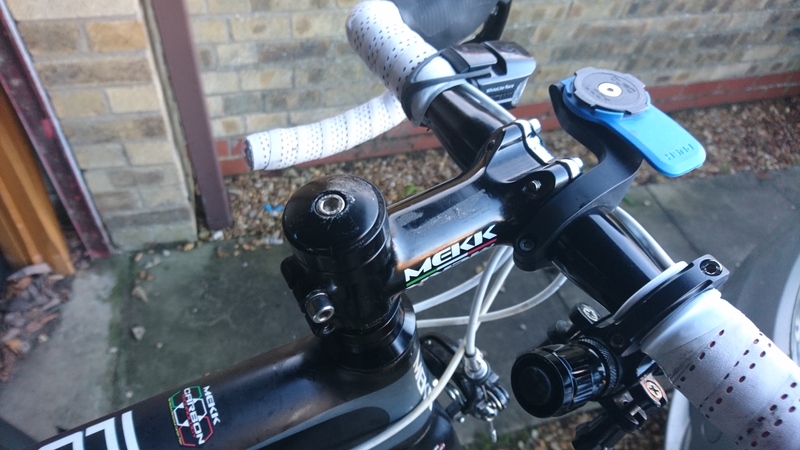 If everything feels firm then you’ve done the top cap up enough (possibly too much already), if you can feel the steerer tube of the fork wobbling within the headset then you need to tighten the bolt further. The correct amount is ‘just enough to remove the wobble’. Once you’ve got this set, then you can tighten the stem bolts making sure that you’ve got the wheel and handlebars lined up! You can do these bolts up nice and tight; or to the correct torque setting with a torque wrench if you’re feeling pro! So that’s another job done for the first time on this bike. 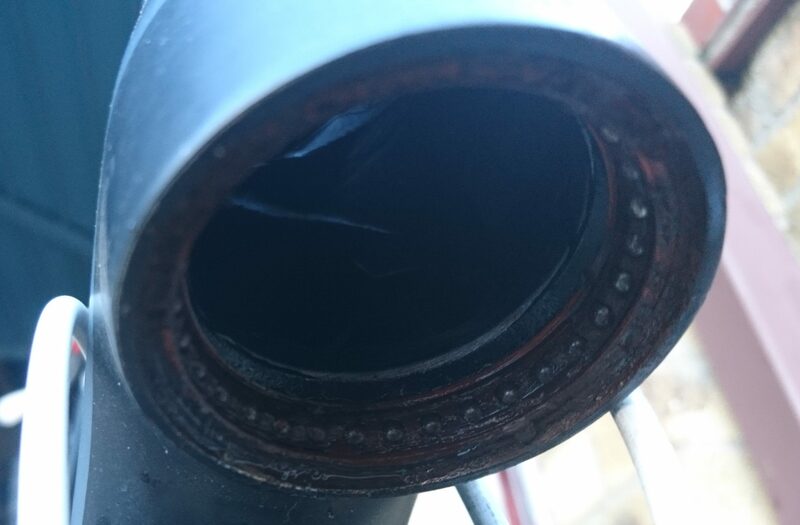 I’ve done a little over 13,000 km on this bike so far and this is the first time I’ve needed to pay any attention to my headset bearings so I think that’s fair. Although now that I’ve had it all apart I might consider fitting a sealed unit at the bottom. Hope Technologies sell their ‘pick n mix’ headsets, the idea being that you can account for bikes that need odd combinations top and bottom, however it also means that you can buy just the top or just the bottom. I’m not certain as I haven’t looked into it fully yet but I’m pretty sure that the Hope ‘E’ coded lower part will fit the MEKK head tube. But for now my bike is back together and ready for the next epic ride; or just a quick blast along the local roads!